I am a feminist alright. The good kind, not the male bashing ones. I think that women are equal to men and need no special privileges or reservations. I am a pretty cool person when it comes to feminist issues. I just express my view and stay still. But there are a few things doing the rounds on the Internet which would offend every woman on the planet. The above image you see, came to me via a whatsapp message. Before I could get over adjusting my eyes to such stupidity, I saw the same thing on Facebook as well. Out of curiosity and because I wanted to, I checked the comments on the picture. While most women have expressed outrage over it, most men have laughed and agreed with what the image is trying to portray. Love marriage is still somewhat considered a taboo in our country. Some people would go on to demean the concept of love no matter what. Even my marriage was said to be a love+arranged marriage to some guests. Most parents can't get over the fact that their children have grown up enough to choose their own life partners. Most mothers more often than not think that their sons have chosen the wrong girl. Do women who arrange marriages for their sons, check out the roti making skills of the girl before they let their sons meet them? What about vegetable chopping skills? And dish washing skills? You know no matter what it is, a love marriage or an arranged one, women are always reduced to someone who needs to do the cooking and get it right no matter what. This is what angers me the most. I had a love marriage. There was absolutely nothing arranged about it. Our parents had to agree to the wedding, because we did not give them any other choice. I am a working lady and lead a busy life handling my work and a zillion passions. Thankfully cooking is one of them and I do very well at yet. Yes sir, my roti's are perfectly round, soft and puff like the ones they show on TV. I knead the dough myself and roll it out myself too, in case you planned on asking. I also can make a variety of curries and even though you think that I must be gloating, they turn out to be delicious. My cooking skills would have been the same, no matter what kind of marriage I had or whom I was married to. It is an interest and a passion that I give time to. I watch cooking shows, read a lot of recipes online and invest time in trying them. That makes me a good cook. Not my marital status. While I was searching for images for my previous post, I came across the above one. Believe me I was so angered after seeing it that I was shaking. 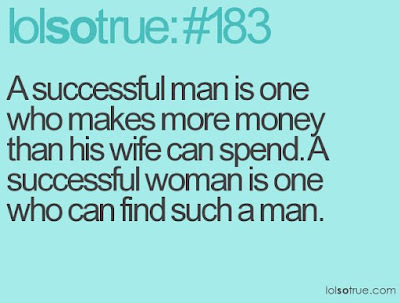 What makes people think that a woman needs a man to buy her stuff. Why can't she buy things herself? Stuff like these are insulting to say the least. Now that most of the women are working I don't see why they should have to depend on a man to shower gifts on them. I make enough money to afford all the things that I want. Am I not called successful then? 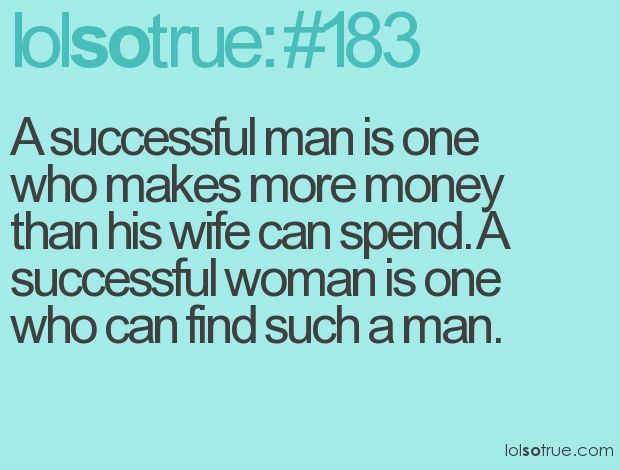 Or should I only consider myself successful if I marry a wealthy man? Well, I did that too. So what does that make me. Twice as successful? Ridiculous. If money is a criteria for success, that explains all that is wrong with this country. There was this issue in the news recently where some fellow made a comment about woman having to let go off fashion and style, in order to be successful in life. Why do they even let such people come in to the spot light I don't understand. So a woman is not expected to take care of herself and just stay devoid of make up and new clothes to get ahead in life. Seriously, who comes up with stuff like that? How does what you wear affect your life? How does wearing lipstick hold you back from attaining what ever you want to? The guy also mentioned that guys must give up addiction to succeed. Addition to girls who are fashionable and wear make up is what he meant I think. Finally the Supreme Court has found its voice and asking the Sabarimala officials while women are not allowed in the world famous temple. For those who don't know it yet, there is a rule that women in the menstruating age are not allowed to visit this temple. So basically a female who is between the age of eight to fifty is not allowed. Why? Just because she menstruates. This is a debate that has been going on since ages and is not only limited to temples. This is a regular affair at most homes too and I was subject to it first hand. For the nth time, a period is a natural thing that a girl has to go through three to five days in a month. That doesn't malign her in anyway or make her impure. Why is a woman on her period not allowed to pray? Is she not a child of God on those days? Women are as human as men are. Women are as strong as men are. Let us respect them like we would respect any other human being. Jokes about her cooking skills and shopping interests just generate a laugh or two for juvenile idiots. Dictating rules for a woman on her period is inhumane and absolutely disgusting. Surprisingly, some women do agree to the Sabarimala rule themselves. If some women think that they are dirty and impure during their period, then that is their choice. In my opinion they should think the same about themselves even when they are not on their period. As for me, I think that I am awesome and fabulous all the time. When I'm on my period, when I'm cooking or when I'm just being me. I do know that such images and memes are made solely for the purpose of humor and entertainment, but they clearly are in poor taste. Or is it just me who thinks so? A great read. I'm contemplating the rule and point of views of Sabarimala Priests too. I think we are all fabulous and awesome everyday, just like you mentioned. I echo your sentiments. I saw this on FB and was surprised that women themselves were sharing it. All for a good laugh at their own expense, I suppose. I didn't find anything remotely amusing about the whole scene. I'm sure it was a woman who created this too. You so spoke my mind. Its crazy how many of these sexist things are passed of as "Just Joking...You need to Chill" comments and memes. Unfortunately I have seen a lot of Women laugh at these jokes too, because well they can choose to. Even if it is in all good humor or Just Entertainment, it is really not that funny. I keep saying that it is stupid that people think women need empowerment, because you cannot empower what is already strong. We just need to realise our strength. At times I feel that women mock themselves more than men. It's sad, alright. Yes, they are in very poor taste, and I don't find them the least bit amusing. I recently read a tweet by Sreesha about her colleagues expecting her to know how to drape a saaree, just because she was married. I have experienced the very same thing. People need to grow up and stop living in the stone age! Like I said, at a fellow blogger's thoughts on the same topic, the whole forward has left a bad taste in my mouth for rotis. It's odd, how everything and anything under the sky is associated with marriage somehow. Didn't find it funny at all. I'm glad you share what most of us feel. Couples like that should be shot. What's to hide? First thing first. When I saw ample pics of food on your twitter, I said to myself, besides the compelling posts that she writes on her blog,this girl is a passionate foodie. When I read your poem which describes your combined passion for food and cooking, I thought that she cooks with passion as she writes with passion. The poem reflects your love for cooking, frankly. 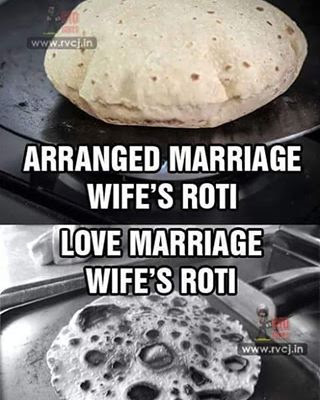 This roti pic has been doing rounds on FB, and when I saw the pic here on your post, I remembered reading that yours was love marriage and she should write on this. I mean how can you generalize a persons marriage based on roti? Ridiculous, even I had this same feeling. About love marriage,it is still a taboo in our country, n parents hesitate to say love marriage. This post of yours is compelling. Thank you so much Seeya! That picture made me sooooo mad; in fact, Sid, Jaibala and I were just discussing it yesterday (following the tweet Shantala mentioned above)! Yes, my rotis are also round, thank you very much. And I also had a love marriage - but don't listen to my mom about it, who made up this whole convoluted story in which my parents and his knew each other years ago and decided to arrange it irrespective of the fact that we're from different states/castes/other Indian crap (in her version, my husband and I weren't even aware of each other's existence!) I don't know why she's embarrassed about her daughter's love marriage, but if you knew my mother, you'd do better than to ask. Hehe, your mom sounds so adorable! I am with you on the self-deprecatory humor bit. Take a self goal ladies, don't point it at others. OMG you won't believe. I was about to write on this. Saw this picture on facebook and I was like, how can people even find this funny. I totally agree with you. This was too blood boil inducing to ignore. I have a friends group on whatzapp always sending such sexist jokes on women ....all guys agreeing to it and laughing like it happens to them everyday.Just feel like exploding into a rage wondering what they find so funny in something which is just not true. You know one fine day I'm sure these women will get what they deserve. Hahaha, you should have! I would have. You spoke my mind!! Such memes, jokes are not funny!Period! And it completely baffles me when women pass on these so to say jokes amongst family and friends. Women should understand and know their worth! Women these days have clearly become the enemy of well, women. Very well put across Soumya!! When one of the uncles shared this on one of our family watsapp groups, I was so upset.....and I saw some aunties & Bhabhis sharing this too...I expressed my opinion diplomatically, such a bad taste!! I too had a love marriage and my wife makes wonderful chapatis....and even if she doesn't, how does that matter? Does one get married to get plate full of well cooked chapatis? I know! It is such a sad plight. The state is sad Soumya.. I really don't get whats with the make up and being successful has in common? And the roti thing.. it was such derogatory thing to come up.. Everything on social media these days gives rise to a new doubt, only because of the stupid topics they come up with everytime! I agree, Geet! Social media is turning people into anti-social beings. These things may be the reason why we havent progressed after all these decades. Oh you hit the nail, my friend.